Do you just love killing two birds with one stone? Not literally, of course, but you know what I mean. Efficiency drives our world today which is why you should give Fertigation a try. Fertigation or, Chemigation, is the application of fertilizers, soil amendments, or other water soluble products through an irrigation system. With a Fertigation system, by telling your sprinkler system to turn on and off, your Orbit Controller is going to do all the work for you! Read 5 Things You Need to Know About Fertigation for more awesome information! All you need is an EZ FlO Fertigation Tank and some organic fertilizer and an Orbit irrigation system, whether it be a hose faucet watering system or an underground automatic sprinkler system, either will do just fine. 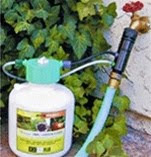 The EZ FLO Fertigation Tank hooks right up to your sprinkler system and dispenses the fertilizer along with the water. 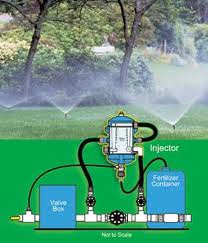 Your irrigation system does the work, not you. The worry of Overfeeding and Underfeeding are both eliminated. The overall amount of chemicals applied is reduced versus dry application. So why not give Fertigation a try? Just remember that because of the potential risk in contaminating the potable (drinking) water supply, a backflow prevention device is required for most fertigation systems. Backflow requirements vary greatly so it is very important to understand the proper level of backflow prevention required by law.